Every place has its contrasts; its juxtapositions; a sense of yin and yang. We thought for today’s blog we would take you along with us, The Milk Maid and Farm Girl, as we undertake the school run. Our apologies in advance for the quality of the photos (blame a combination of elcheapo cellphone, impatient school girl and a photographer who had left her glasses at home) which we hope show just how hodge-podge and beautifully ugly the Homestead’s surroundings are. 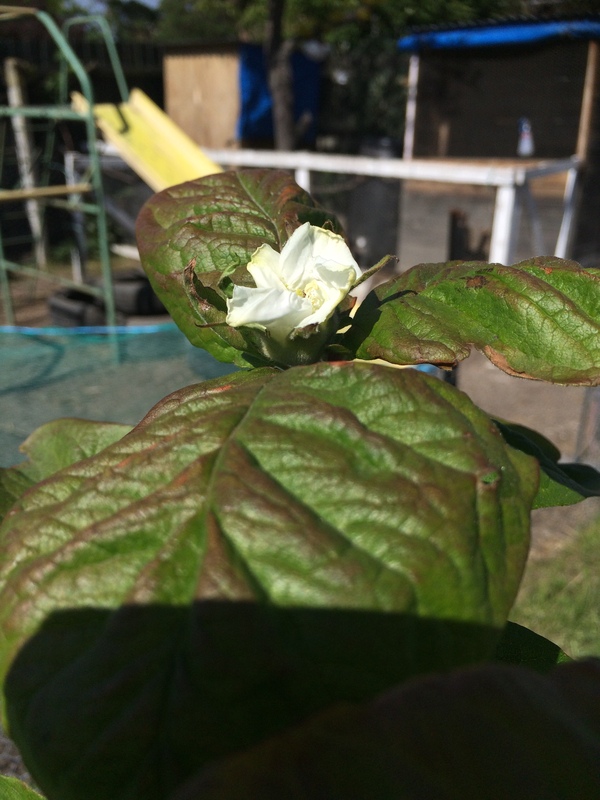 and take a moment to marvel at The Christmas Medlar’s first ever blossom. The Avon-Otakaro River, situated about 100 metres from the Homestead’s backdoor, doesn’t seem to care whether it’s flowing through posh Mona Vale, quake-bashed downtown Christchurch or good ol’ New Brighton, it’s still pretty. 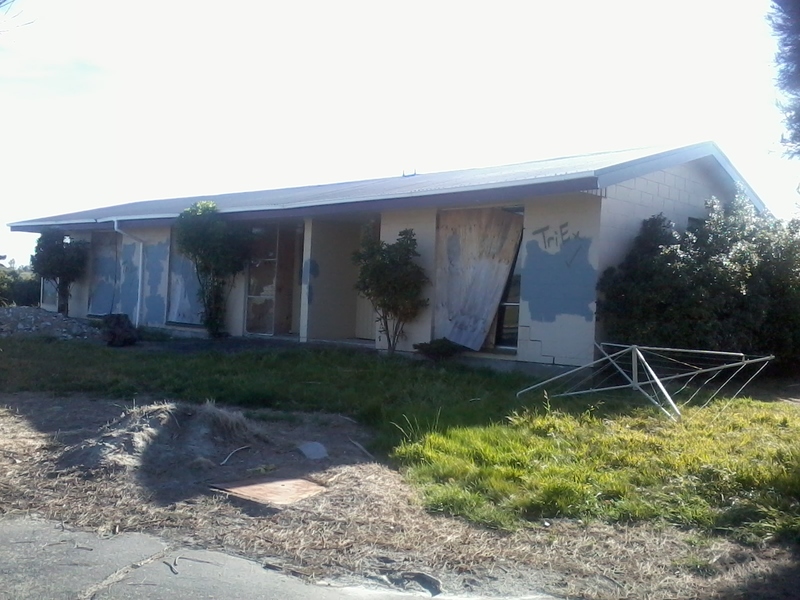 This is part of a 28 unit council housing complex, the only buildings still standing in this area. But there’s no time to dally! Back onto the cycle way; our intrepid cyclists are experts at picking a course through the potholes and uneven surfaces. 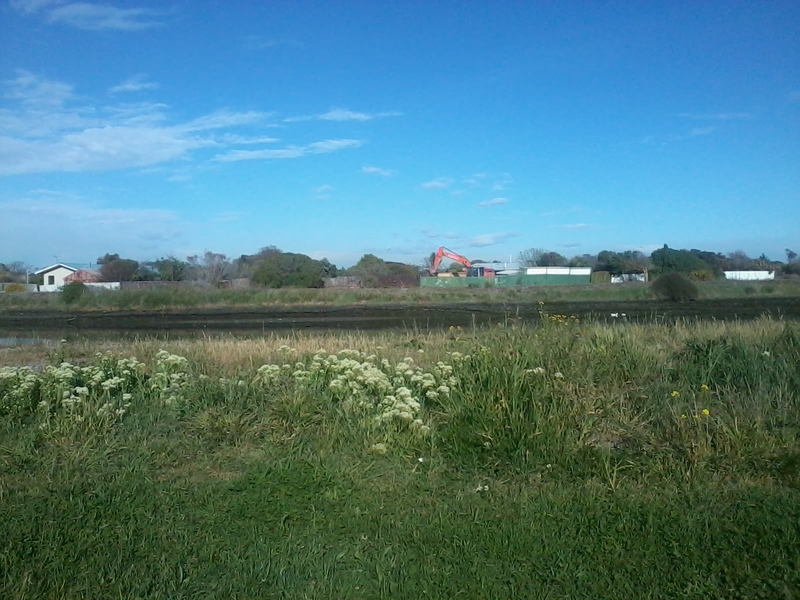 On the other side of the river, demolition continues on the few remaining houses in Bexley. The only thing noisier than the crunch-crash-crumble of the digger chomping through yet another building was one very irate goose. All photos are now taken on the move as Farm Girl does not want to be late. 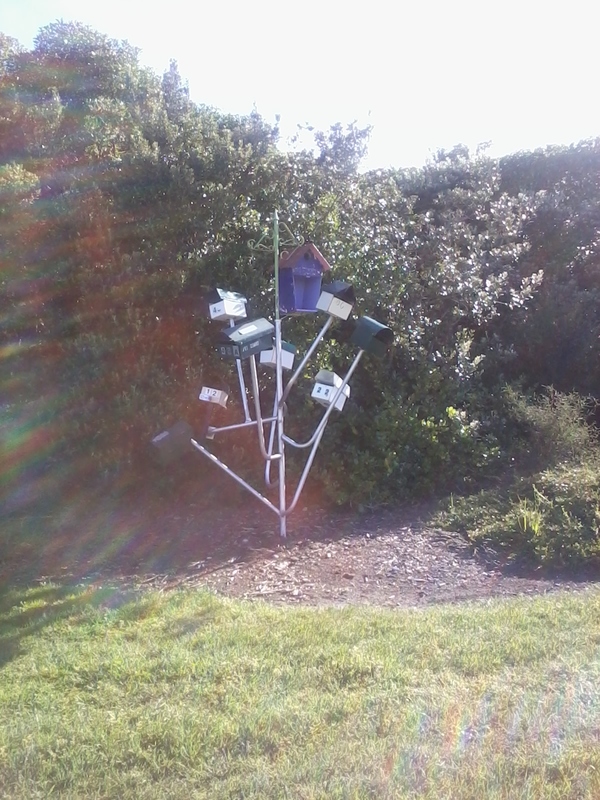 Past the Mailbox Sculpture – these are from Red Zoned houses. Flags flutter everywhere as if, all over Christchurch, a collection of street parties are about to occur, but in reality it’s to remind the contractors of the presence of overhead wiring. And then we’re there:The Kingdom of Nova. Our journey is exactly one kilometre door to door. 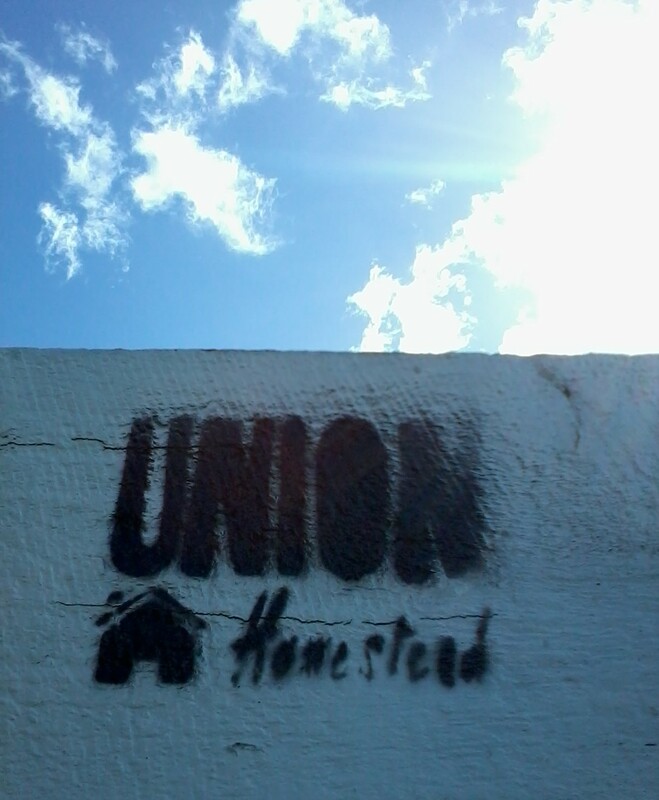 We love it here, sandwiched between the Pacific Ocean and the Avon-Otakaro River. 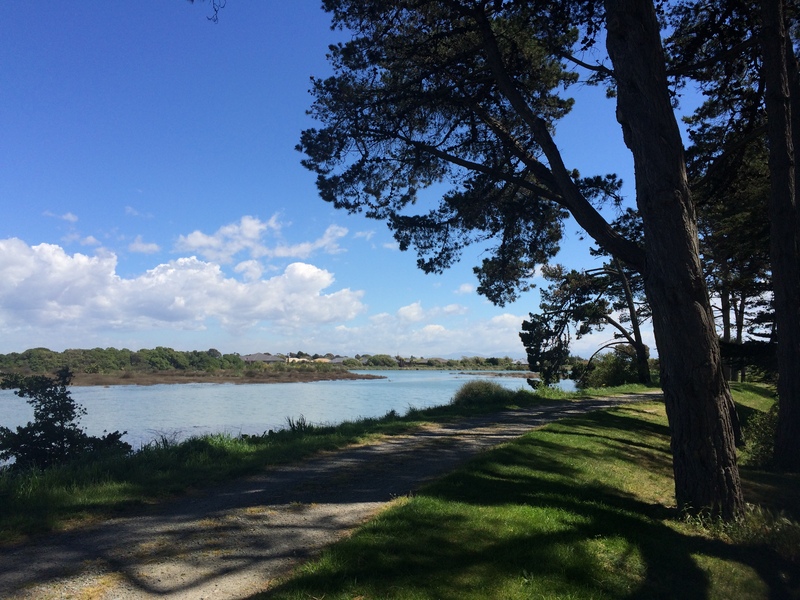 We love the sun sparking on the water and the easterly performing origami on the washing; our very own kotuku (white heron) paddling in the river and the gulls hassling yet another fish and chip diner, the beach, the river, the buzz and the people. 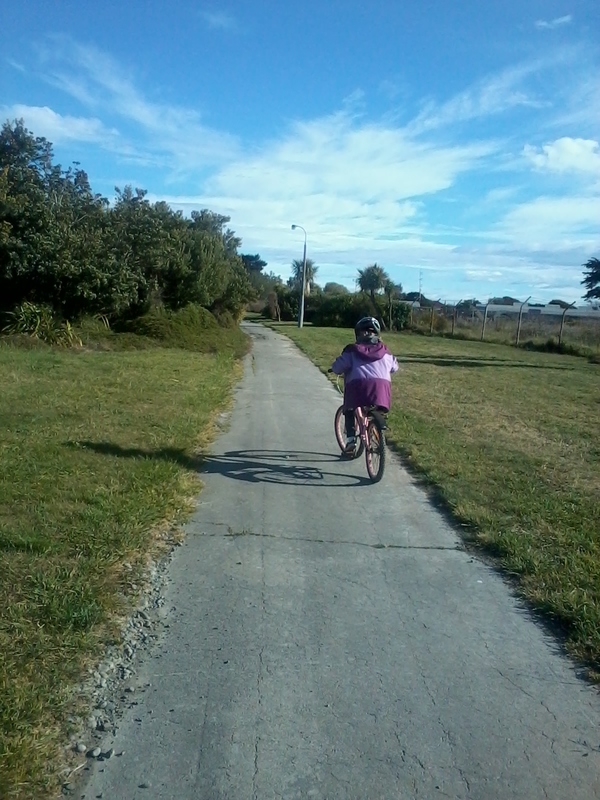 This entry was posted in Family, Union Homestead and tagged Aotearoa, Avon River, Avon-Otakaro River, bike, biking, birds, children, Christchurch, Christchurch quake, cycling, cycling with kids, differences, estuary, journey, juxtaposition, kids, New Brighton, New Zealand, Otautahi, scenery, school, school trip, to school, wetlands. Bookmark the permalink. Thank you for the tour, it is always interesting to see where people live. I can totally see why you love being where you are, thank you for the tour! Thanks for the photo tour, what a beautiful place you live in…a nice flat 1km bike ride, my kind of commute to school and back. Does it flood along there in the winter? The Avon seems so big on your stretch compared to the meandering little stream it becomes in the city centre, though I gather it caused havoc with flooding last spring in town, small though it might appear. I have wondered once or twice about the Kingdom of Nova – I had pictured something more bricks and mortar -ish somehow. 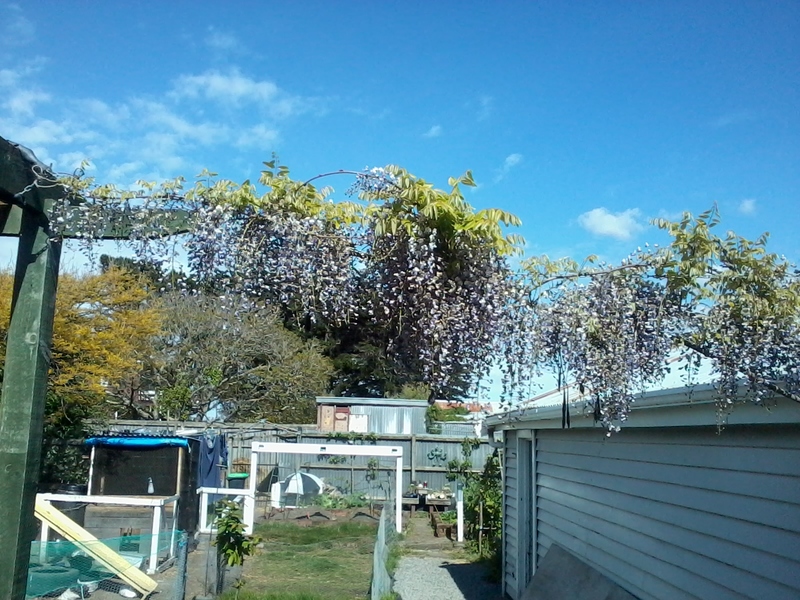 Your wisteria! What a success story. 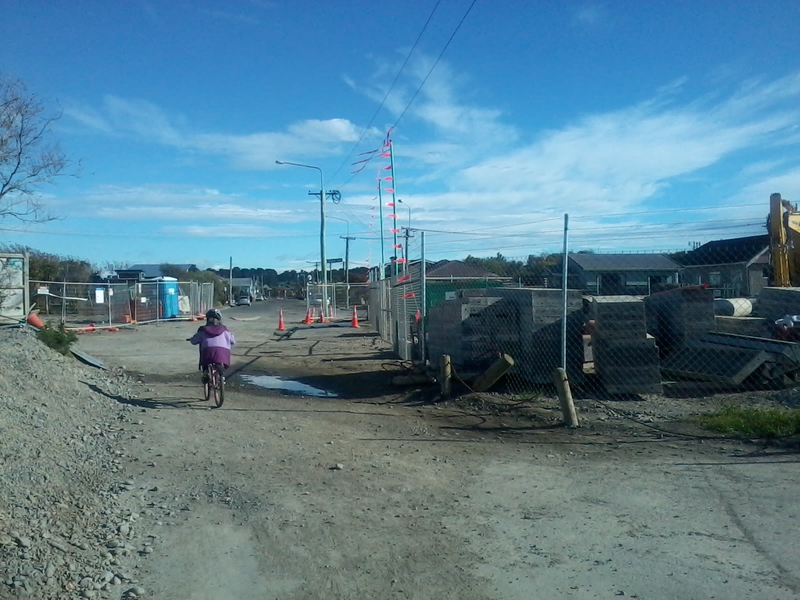 With Bexley returning to floodplain since the quakes we get very little flooding here now. When we first moved in the gutters would back up with every high tide but now that only occurs with freakishly high King or Spring tides. The river is very tidal here, becoming officially an estuary about half a km downstream. 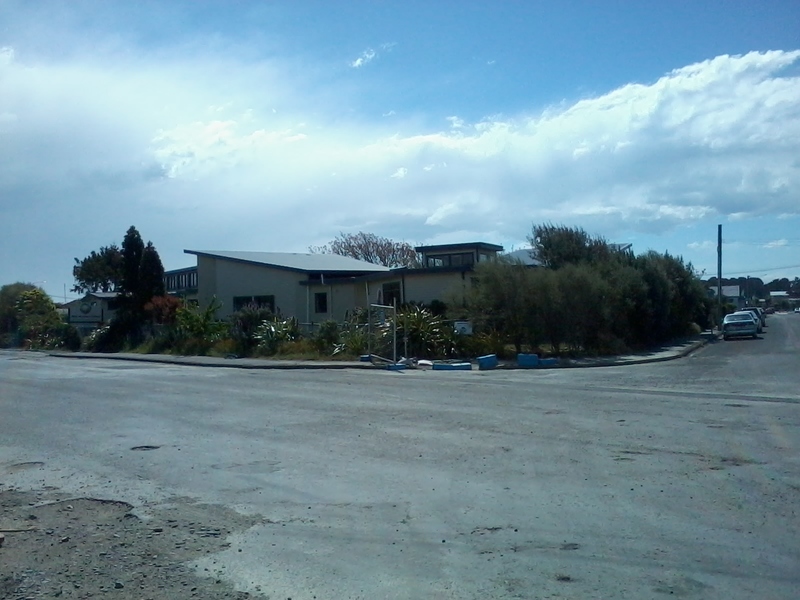 Sadly, our lovely little bike commute is a finite arrangement as the school is going to have to relocate; a combination of land subsidence, quake damaged buildings/landlord not keen to replace, and keeping the roll up – people are not keen to travel over the quake damaged streets each day to drop their children off. We’ll make the most of it while we can and see what pans out.